Is located right infront of the ocean in Playa El Cuco, around 2 hours away from the international airport, transfer can be arrange at any time, the property is close of the area of "Esteron" in Intipuca, this is an virgin beaches area next to the rivermouth of El Cuco beach. There are different activites available offered by the hotel, including boat rides and fishing trips, surf tours by boat available to the closer popular spots as Playa Las Flores and Punta Mango. 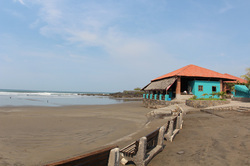 El cuco is a popular beach town at the east side department of San Miguel, very close from the Fonseca gulf that share El Salvador with Nicaragua and Honduras. This fantatic hotel is one of the most popular accommodation for international visitors, great service and the best rates in rooms with fan and air conditioner. 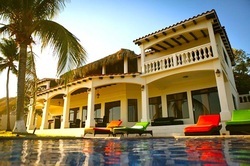 All the rooms are equipped with private bathroom, small private balcony with hammocks and chairs. Big comun areas right infront of the ocean, swimmingpool area, and restaurant service with a varied menu, vegetarian meals, pastas, sandwich, hamburguers and seafood available. Air conditioner US$10 extra per room. 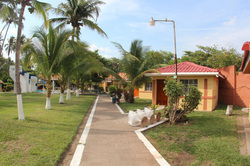 Tropiclub hotel in Playa El Cuco is a great option for local families or young groups looking for bungalows with multiple beds, basic confort with big space gardens and swimmingpool area.